The majority of breast cancers developing in BRCA1 mutation carriers are triple negative breast cancers (TNBC), an aggressive subtype that accounts for 15–20 % of sporadic breast cancer. 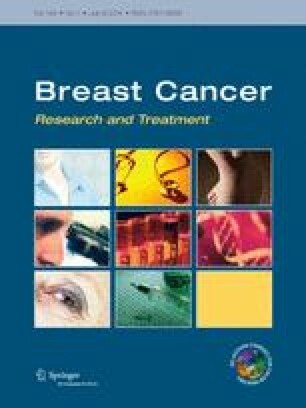 We compare the clinical outcome and sites of relapse of TNBC in BRCA1 mutation carriers and non-carriers who received adjuvant chemotherapy. Women with stage I–III TNBC who had BRCA1 testing within 36 months of diagnosis and received adjuvant chemotherapy were identified from clinical databases at two academic institutions. Sites of relapse, freedom from distant metastasis (FFDM), and breast cancer-specific survival (BCSS) were determined. RCA1 carriers (n = 89) were significantly younger at diagnosis (P < 0.0001) than non-carriers (n = 175). FFDM at 5 years was 80.5 % for carriers and 76.9 % for non-carriers; with median follow-up of 55 months, hazard ratio (HR) was 0.90, P = 0.71. Sites of recurrence, including brain, did not differ significantly. BCSS at 5 years was 88.1 % for carriers and 81.4 % for non-carriers; HR 0.60; P = 0.15 at 55 months follow-up. BRCA1 carriers who underwent oophorectomy had a significantly lower rate of death from TNBC, with an adjusted HR of 0.30 (95 % CI 0.10–0.94). Adjusting for age, oophorectomy, and prophylactic mastectomy, BRCA1 mutation status was not an independent predictor of survival (HR 2.1; P = 0.13). BRCA1 mutation carriers with TNBC had similar survival rates and sites of recurrence to non-carriers after treatment with conventional chemotherapy. Carriers who underwent oophorectomy had a significantly lower rate of breast cancer-related death; this finding should be studied further in all women with TNBC. This research was supported by grants from the Breast Cancer Research Foundation. All research activities carried out for this study comply with the current laws of the United States of America, where this research took place.